The aim of the Transnational Modern Languages series is to provide a model that allows Modern Languages to be construed and practiced not as the inquiry into separate national traditions, but as the study of languages, cultures and their interactions. The series will build upon expertise, research and teaching that are constantly being developed in Modern Languages, but which are often insufficiently visible in the public sphere. By doing so, it will demonstrate the value – practical and commercial, as well as academic and cultural – of modern language study when conceived as transnational cultural enquiry. The texts in the series are specifically targeted at a student audience and designed to be used as key texts in Modern Languages disciplines and as a pedagogical resource in cognate disciplines. They will address how work on the transnational and the transcultural broadens the confines of Modern Languages; opens an extensive range of objects of research to analysis; deploys a complex set of methodologies; and can be accomplished through the exposition of clearly articulated examples. The series will be anchored by the Handbook, Transnational Modern Languages: A Handbook, eds. Jenny Burns (Warwick) and Derek Duncan (St. Andrews), which sets out the theoretical and conceptual scope of the series, the type of research in which it is based, the kinds of questions that it asks, and the importance of the pedagogical function that it will serve. Following on from the Handbook, the series will produce a text for all the major disciplines that constitute the study of Modern Languages. 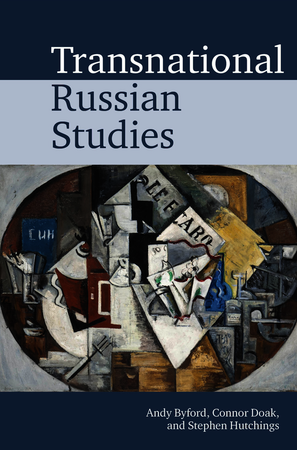 Transnational Russian Studies, eds. Andy Byford (Durham), Connor Doak (Bristol) and Stephen Hutchings (Manchester).